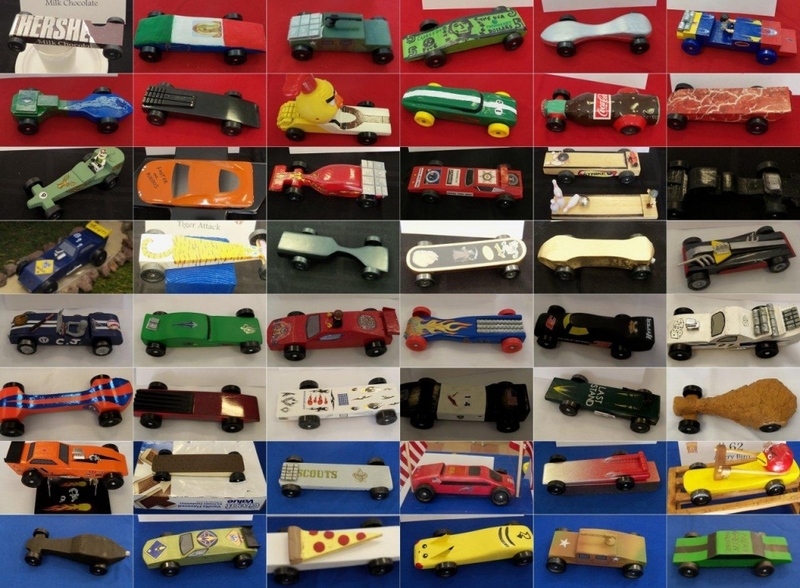 Another exciting Pinewood Derby was conducted last Sunday, with nearly 50 scouts vying for the coveted first place race trophy and various design ribbons. 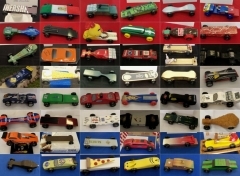 Even siblings and dads showed off their car building in their own races. Never before have we had such creative designs, nor closer races. 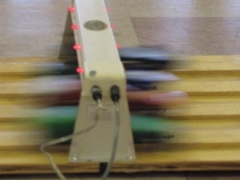 Less than 0.007 seconds separated the top three finishers. 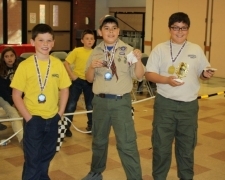 All scouts are to be congratulated for their handiwork and great display of sportsmanship. In addition to the racing fun, scouts were able to try on a real dragster thanks to Eagle Scout Rick, and were entertained by yet more pies in the faces of Christian and Jim. A great day was had by all due to the hard work of many of our great parents. Check out pictures of the event in our photo albums. Ben W., Trent E., Matthew R.
Ethan D., Jared D., Collin H.
Luke C., Trent E., Steven G.
Sam W., Grant E., Ben W.
Chad H., Ian R., Noah G., Tyler B.
Vincent P., Grant E., Alexander R.
Braden H., Arthur N., Ian M.
Tyler B., Ben W., Sam W.
Tigers: (1st place) Aiden H. (2nd place) Nicholas B. (3rd place) Matthew B.
Wolves: (1st place) Jackson N. (2nd place) Conner R. (3rd place) Jake Q. Bears: (1st place) Tyler H. (2nd place) Braden H. (3rd place) Luke C.
Webelos: (1st place) William B. (2nd place) Mikal Q. (3rd place) John R.